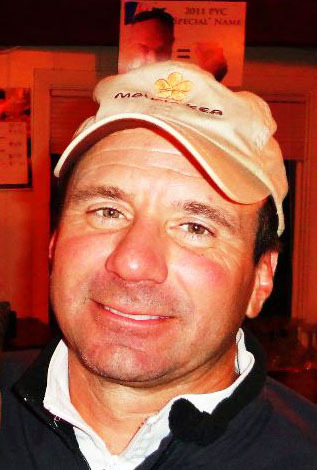 Get to know Dave “Dex” Decker, NCASA Treasurer, from Pewaukee Yacht Club. “I grew up sailing Sunfish and Butterfly’s on a small lake near Pewaukee. I skipped over the Pram and X in favor of an M16, then for many years raced the C scow on Lac Labelle. It was at a C Blue Chip regatta, where Bill Keck watching his son race, remarked that he just couldn’t physically sail the C scow any longer. I challenged him, half joking, to buy an A scow and all of the La Belle C boaters would crew. Bill went on to order a new A Scow, Seiche, in 1995. That was a resurgent year for A boats, with all the new boats now having asymmetrical kites. We had many great years, and after Bill passed away from cancer and the boat sold, I was looking to continue A scow sailing. Thanks to Coleman Norris, I was able to use his boat Kermit for many years. I finally was able to jump into buying the current “yellow boat”, the Flying Wasp, in 2007. Thanks to Todd Haines, we were able to move the chain plates and rig up the new swept-back mast. His knowledge and help have been invaluable. Copyright 2018-2019 National Class A Scow Association, All Rights Reserved.